How do I do a trademark search? The first step of getting a trademark is to see if there are likely to be conflicts with other marks. The conflict is evaluated on the basis will the mark create a likelihood of confusion with a prior mark, including the predominant questions of if the marks sounding and appearing the same, and if the goods and services the marks are used on will likely cause confusion with the senior mark holders. There are several places to look for these potential conflicts: the federal database of trademarks, state trademark registration databases, common law marks used without being registered, corporate names, and trademarks registered in the 50 states. A conflict in any of those categories can be a problem for registering or using a trademark. It is advisable to search all of these sources for possible conflicts, but at least searching the federal database is essential to begin. One of our most recent patents is on the pupRUNNER dog trailer. We have one issued patent, 8,950,767, and one that is about to issue. The non-provisional patent application is examined by an examiner at the Patent Office approximately one year after filing and typically all of the claims are rejected by the examiner. We then have a chance to respond to his/her rejections, a task which is billed by the hour and is typically $800.00-1,800.00, depending on how complex the response is. Sometimes, a rebuttal of the initial rejection results in obtaining allowed claims. Once the claims are allowed, about another $1,000.00 is required for the issue fee. This happens about two years after filing the utility patent application. More than one round of rejection and rebuttal are possible. The examination of the application depends on the examiner we get, and how close the prior art is to your device. Bob writes a blog on backpacking technology, which has trip reports, historical outdoor patents, gear reviews, knife making, and outdoor philosophy. Bob has been testing gear such as tents and sleeping bags for Backpacker Magazine for several years. What is the title of the work? Have there been any previous or alternative titles? Was this work part of a larger work, such as a periodical, serial, or collection? What is the country of citizenship or domicile of each author? OPTIONAL: What is the year of birth of each author? (Month and day of birth are not necessary). If any author (who is not anonymous or pseudonymous) is deceased, what is the year of death? (Month and day of death are not necessary). (Answer is optional for any deceased anonymous or pseudonymous author). What did each author contribute to the work being registered? What was the year in which the work was completed? Who will own the copyright, and is the owner a person, persons, a corporation, or other entity? What is the address of the copyright owner? Has this work or any earlier version been registered for copyright before? Is this work based on or does it incorporate any previously-existing work? Copyright is so easy to file that you can do it yourself easily for the $65 filing fee. The enforcement potential is huge, if you have taken the precaution of filing for copyright before you were infringed or within 90 days of creation. So file for copyright on any original creation, such as web sites, greeting cards, books, articles, drawings, photos, furniture designs, software, clothing styles, videos, music, poems, statues, animations, and anything that is an original creation. Go to the U.S. Copyright Office for the forms to fill out for filing, and call me when your copyright gets infringed. The Patent Pending Blog is about the history of technology, especially ancient technology. Examples of posts include The Largest Stone Moved by Man, and Jean-Pierre Houdin’s thoery of how the great pyramids were constructed. A person can do their own patent searching, by accessing two databases which are available to the public. One is the google patents database, and the other is the USPTO patent database. Boise inventors Ben and Anna Carter have one issued patent on their pet trailer, U.S. patent 8,950,767, and another patent on the folding version of the trailer, 20140216352, is about to issue. The trailer described in these patents attaches to a bike, and has a floor that folds up, so a dog can run inside the trailer for awhile, then the floor can be put down and he can ride. They come in small, medium and large, for all sizes of dogs. Each size holds two dogs, and one dog can ride, while the other runs, both run, or both ride. My dog quickly figured out what the deal was, and loved it. More information can be viewed at puprunner.com. 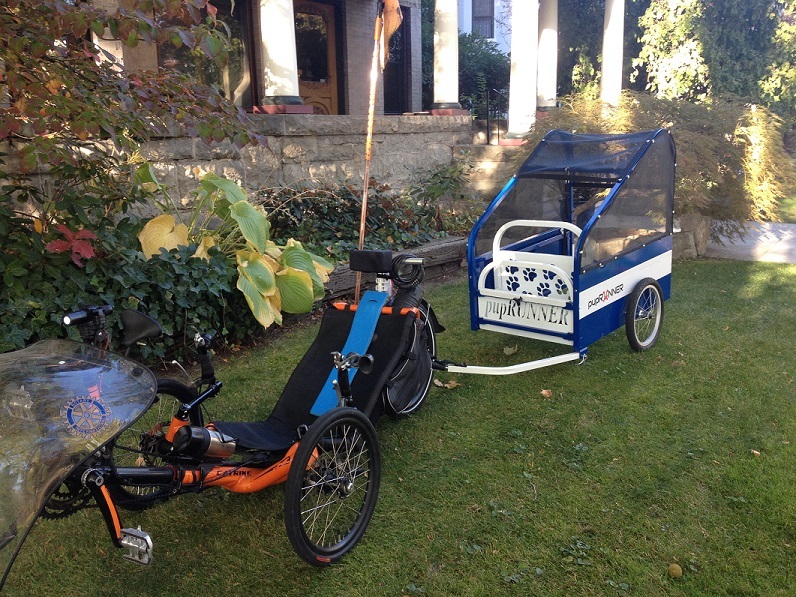 Below: the pupRUNNER trailer attached to my recumbent trike. Once the inventor has made a decision to proceed with filing a patent application for his/her invention, the type of application must be considered. Provisional Patent Application: A provisional patent application is less formal application which allows a person to become patent pending quickly and with less expense. Though a provisional application establishes a filing date which may then be used in the filing of the more formal application one year later, it does not, alone, mature into a patent. This type of application is merely a placeholder that expires after one year. Non-Provisional Application: A non-provisional application is a more formal application which can be filed after a provisional application or in place of one. If the non-provisional is filed within one year of a provisional application for the same invention, the non-provisional application may claim the date of the earlier filing. A non-provisional application is a formal document which requires drawings, full disclosure and description of the invention, claims, and other formalities. Unlike a provisional application which simply acts as a placeholder, a non-provisional patent application is reviewed by an examiner at the United States Patent and Trademark Office (USPTO). Design Patent Application: A design patent application is a specific type of non-provisional application that is available for design innovations of an existing invention. A provisional application is not an option for design patent applications. There are several types of trademarks possible: common law, state, federal and foreign. A federal trademark registration provides priority and protection on a nationwide scope and is excellent for companies that conduct business on the Internet serving consumers in multiple states. A state trademark registration provides state wide priority and protection and is best suited for companies that operate within a single state, such as local companies. Common law trademark rights provide inherent protection when a business is utilizing a trademark in a given area and has developed name recognition within that area. How do I obtain a federal trademark? First, have a trademark search conducted by an attorney to determine if other similar marks exist. A trademark search should not only look for similar marks, but phonetic equivalents, logos, designs, cancelled trademarks, and should give you an analysis of any less similar trademarks which might pose a likelihood of confusion with your trademark. A general computerized search will not be this exhaustive, nor will you have any idea regarding whether a likelihood of confusion exists. While there is no requirement by the Trademark Office that a trademark search be performed, we often recommend that the client have such a search done before thousands of dollars are spent in marketing and advertising…building up goodwill in a company or product’s name. Second, have a trademark application filed for your trademark by an attorney. A properly filed trademark application will avoid common mistakes which will automatically result in a refusal to register your trademark application and/or (quite possibly) a loss of rights. Your trademark is too important to your business to lose–have it filed by a professional. Third, “prosecution” of the trademark application takes place. This is the process where the trademark examining attorney asks for additional information, asks an applicant to make changes to the application, and issues formal “refusals” to register for grounds such as “likelihood of confusion,” and “merely descriptive.” Once the examining attorney is satisfied that the trademark is registerable, the trademark will be published in the Patent and Trademark Office Official Gazette for opposition. The Official Gazette is routinely reviewed by law firms and corporations to ensure that no marks are being registered which are confusingly similar to other marks of clients of the firm or company. If opposition is filed, it is the applicant’s burden to prove that there is no likelihood of confusion between the proposed mark and the pre-existing mark. For “intent-to-use” trademark applications, after successfully negotiating the opposition phase, a notice of allowance will issue, and the applicant has six (6) months in which to certify actual use in interstate commerce and supply samples of its use. Of course, this is a highly simplified discussion of how to obtain a trademark. Again, if the trademark is worth obtaining, it is worth doing the job right. Find an attorney that you trust to file and prosecute the application for you.